If you were to venture into the Tarai plains on the India-Nepal border, not only would you behold the incredible Himalayan Mountain range, but you would discover the beautiful Tharu people. Large families live together in brightly colored houses and work in the fields and forests with tools made by their own hands. Proud of their cultural heritage, traditions, and language, the Tharu are very artistic. Colorful clothing, beautiful jewelry, and intricate fishing nets are characteristic of this people. On your visit to a Tharu village, you would likely find the men plowing fields, planting rice and corn, or weaving fishing nets. The women would be cooking, plastering the houses, or crafting pots and baskets. Tharus believe there is a supreme being but that he is too far removed to take an interest in their lives. Once known for their genetic immunity to malaria, the Tharu are not immune to the disease that plagues all people, a sin nature. God desires them to know Him, but “how shall they hear?” We know that “faith cometh by hearing, and hearing by the word of God,” but sadly, not all of the eight subgroups of the Tharu have the Word of God. The Tharu do not see themselves as one people. Each subgroup holds tightly to its own language and culture and desires to stay separate from the other groups. 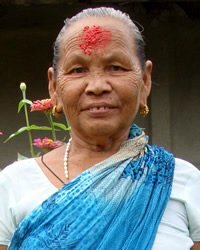 Many Tharu cannot understand the other dialects, and thus require their own Bible. If the nearly two million Tharu are to be reached, they must have God’s Word in their heart languages!